As you design your dream custom engagement ring with an Ada Diamonds Concierge, consider how the look you love might fit with the life you live. While there are a multitude of stunning ring styles, not every design style may be the perfect match for your lifestyle. Read on for our Diamond Concierge team’s best tips on choosing the right ring for your lifestyle. Delicate and dainty diamond bands are a beautiful and increasingly popular style. However, many women with more active lifestyles find that they’re not well suited for a ring style made with an extremely thin band. Very thin bands (less than 1.8mm width) are very pretty and visually appealing but are also very susceptible to wear issues. 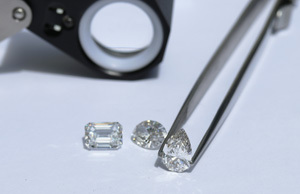 Because the metal is so thin these rings can be pressed out of round much more easily, and they generally have smaller prongs to accommodate smaller diamonds, which means that there is less metal holding each stone in place. If you’re prepared to have very cautious wear habits with your ring, such as removing your ring for most activities, when at home, or sleeping then a thin banded ring style could be a great fit for you. For a compete list of when we recommend not wearing your engagement ring, see this blog post. If you live a very busy and active lifestyle, an ultra-thin band is probably not the best choice for you! Anyone who works a job where they use their hands a lot, or do a lot of lifting/carrying should consider choosing a wider band style to better hold up to repeated pressure. Anyone who works in a lab, hospital, medical facility, or profession that requires regular wear of latex gloves should consider a solitaire style with a low set center stone. Regularly putting gloves over your ring can catch and break small pavé prongs, as well as pull the center stone head out of alignment. If you work in this type of field but love an intricate, high profile design, you’ll want to consider removing your ring when wearing gloves. Anyone who doesn't want to remove their ring regularly or worry about wear habits should consider choosing a ring style with a thicker or wider band (2mm+), or choose a style without small accent diamonds or very low set diamonds. Just like engagement rings, considering your lifestyle is important when choosing your wedding band. With eternity style bands, where diamonds go all the way around your finger, the stones and prongs on the interior of your hand are subjected to constant pressure and impact during daily wear. If you regularly use your hands to lift, carry and hold in your daily life, you’ll need to be much more mindful about your eternity band and you might consider choosing a half eternity or three quarter style band as a beautiful alternative. If you do choose an eternity style, make sure you know when not to wear your ring and plan to remove it regularly to keep it in excellent condition. You’ll also want to plan to have your eternity band inspected and maintained (such as preventative retipping of worn prongs) more frequently than other styles to prevent the loss of stones from your band. Our Diamond Concierge process ensures that your personal diamond expert will help you consider your lifestyle and select a ring style that’s exceptionally beautiful and the perfect match for you. Choosing the right ring style ensures you’ll be able to enjoy the brilliant sparkle of your ring in excellent condition for years to come. Make sure to read our tips on how to care for your new engagement ring!